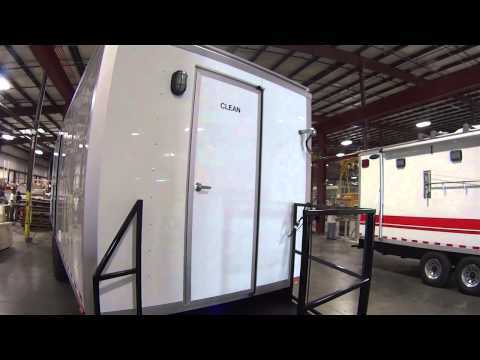 Portable Restroom Trailers has teamed up with the industry’s leading manufacturer of emergency containment equipment to bring our customers the best in safety, hygiene, and comfort. We never want to think about a large scale emergency situation or natural catastrophe, but if one occurs, Portable Restroom Trailers offers solutions. This custom 20′ Mass Casualty Trailer includes s four shower configuration. The unit comes equipped with water heaters, lead and asbestos filtration equipment, negative air filtration, and other features. The trailer includes two (2) longitudinal decon compartments, separated by a full length and full height vinyl wall partition curtain. The partition will be suspended from the ceiling with heavy duty PVC sliders and secured to the end walls with cinch straps. The wall can be opened up for a “rehab” unit. The side curtains shall be sliding and will be secured to the walls with footman loops and cinch straps. Each decon compartment consists of a contaminated area, a decon solution application and rinse area, and a clean area. The rear of the unit consists of two (2) contaminated areas, each with vinyl clothes chute, a flow through brush for performing gross decon with a 6’ stainless steel metal flex hose, and stainless steel quick disconnect fitting, and a hand held shower wand for rinsing with 6’ stainless steel metal flex hose and stainless steel quick disconnect fitting. QD fittings to be interchangeable with exterior shower nozzles. Ball valves are included to isolate control of the water in the gross decon areas and shower areas. The area ahead of the contaminated (dirty) area is the decon solution application area and the rinse area. Each side shall consist of a vertical manifold which includes three (3) shower nozzles @ 1.0 GPM each for solution and three (3) shower nozzles @ 1.0 GPM each for rinse. Two (2) shower head nozzles @ 1.0 GPM, will be included in the center of the ceiling spraying straight down, one for solution and one for rinse. The shower system is controlled by a push button switch located on the wall next to the shower manifold and is connected to a timer which provides a preset run time for solution and then for rinse. To operate, the patient pushes the start button and the decon system will automatically operate through one complete solution and rinse cycle. Ball valves are located outside the decon area which allows an operator to manually activate the showers. A privacy curtain and a stainless steel trough drain is included on each side of the solution and rinse area. The area in front of the solution and rinse area is the clean area, for drying off and dressing into clean clothing before leaving the site. Post decon kit storage will be mounted on the front wall in the clean area, each side will include six cargo net pockets to store post decon kits. They are the perfect fit for job sites, such as lead abatement, chemical companies, safety companies, or other industrial applications.